Discover the hidden treasures of the Dalmatian Coast on this 8-day voyage. M/S Splendid slips effortlessly through the turquoise Adriatic Sea, wending her way between necklaces of islands dotted here and there. There are cities which thrive on their legend. 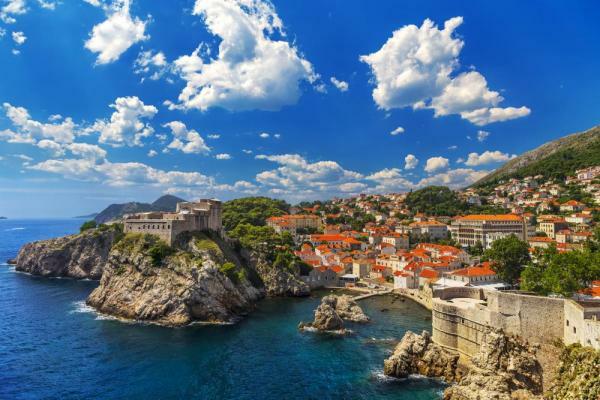 Explore the wild beauty and pearls of the Adriatic: ancient ruins, a wealth of art, and timeless cities just waiting to be discovered, such as Dubrovnik, Korcula, and Hvar. 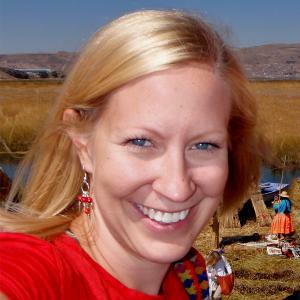 Welcome meeting starts at 7:00 p.m. Be introduced by your Cruise Director to the Captain, your crew, and of course your future fellow passengers. Welcome dinner is served at 7:30 p.m. Embarkation is possible throughout the day; passengers arriving in the morning cannot enter their cabins before 1:00 p.m. but they can leave luggage on board. The Captain waits for all passengers arriving late at night. An English-speaking guide walks you through historical Diocletian’s Palace on a morning Split City tour. Split is the second largest urban center in Croatia and the seat of Split and Dalmatia County. It is traditionally considered to be over 1,700 years old. Since 1979 the historic center of Split has been inscribed on the UNESCO World Heritage Site List. At 12:00 start your cruise to Omiš, an ancient town with city walls, fortresses, and stone churches located at the delta of the Cetina River with its wonderful beaches. For centuries Omiš was a symbol of retaliation, courage, and strength of the famous pirates against the Venetian Republic. After Omiš cruise across the Brač channel to continue towards Pučišća, the biggest village on the island of Brač. Nowhere in the system of towns and villages in Dalmatia does terrain play such a compelling role as in Pučišća with its spectacular irregularity of the steep-sided natural harbor, its authentic Mediterranean architecture, and rustic ambience; the fjord-like inlet meets three narrow valleys that descend from the hills to join those quiet and beautiful waters. Spend the night in this very quiet small town. Nightfall unifies the diverse features of Pučišća that have intrigued you by daylight. Start your day with a morning departure towards Bol, said to have the best beach for swimming in Croatia named Zlatni Rat (Golden Cape). Stop in Bol and enjoy this nice Dalmatian town for a walk, or to have a cup of coffee and take a swim until lunch is served on board. After lunch continue cruising towards the sunniest island of Croatia – the island of Hvar, along the many coves and bays on the way. 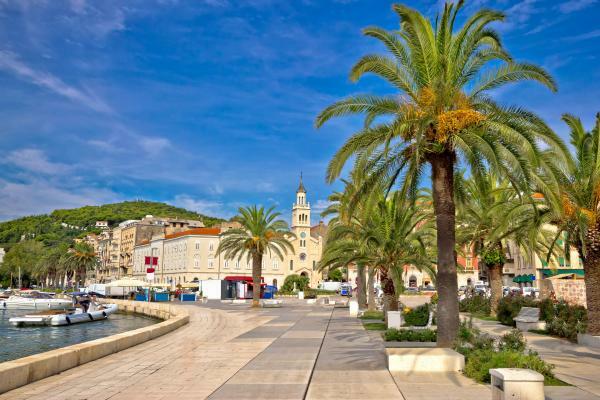 Hvar is one of the most popular, very attractive tourist destinations and a meeting point for the international jet set. Upon your evening arrival at Hvar, a local English-speaking guide walks you throughout the town introducing you to the history, culture, and way of life on this island and explain how lavender was traditionally farmed on the Island of Hvar for centuries. 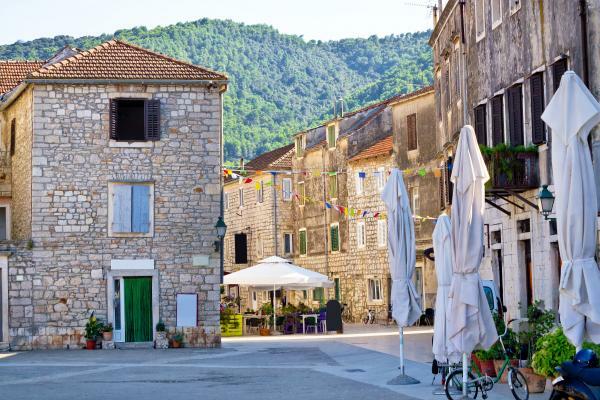 Have an evening in Hvar free on your own to explore and dine in one of numerous family owned restaurants. Start your day with a morning cruise towards Island Bisevo with its Blue Cave. The cave has its own natural entrance which is located below sea level, which requires that its visitors dive deeply only to resurface into the cave’s mysterious blue depths. This natural phenomenon creates a magical effect of deep blue and shiny silver, mystifying her visitors. However, sometimes high waves prevent the entrance to Blue Cave, which is something you shall not know before the morning designated for your visit, and this is why entrance fees are paid on the spot. Vis is a pearl among Croatian Adriatic islands, left untouched by the development of tourism for so many years - due to its strategic location on the open sea, it served as a military zone for many years. Beautiful beaches, and preserved nature, ecological agriculture, and preserved traditional architecture are unique advantages of this unique Croatian island. Enjoy a free evening in Vis. Depart towards the island of Korčula. Stop for a swim before lunch and in the afternoon arrive to Korčula town, on Korčula Island. Korčula is known as the birthplace of Marko Polo, the famous explorer. The English-speaking guide walks you through narrow and cobbled streets. The rest of the evening is free to enjoy dining at one of the local restaurants of your choice. After breakfast cruise to the Mljet National Park, passing by magnificent shores of the Korčula islands archipelago, with a swim stop along a way. Have lunch. 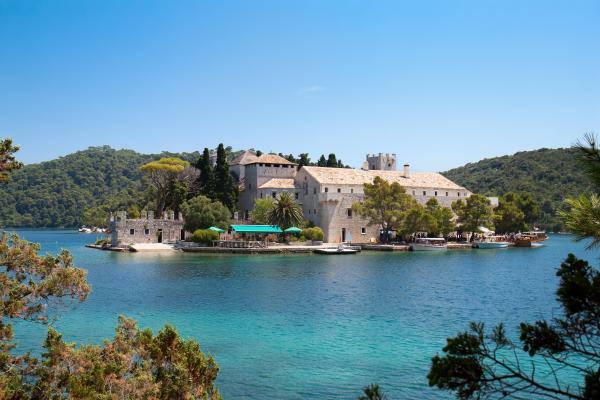 Upon arrival to Mljet National Park, have some free time to explore the park (entrance fees are not included), to walk around the Great and Small Lake, and the Islet of St. Mary with its Benedictine Monastery from the 12th century. This morning depart to Dubrovnik, sailing along the shores of Mljet and the Elaphite Islands, where you have a swim stop and lunch arriving to Dubrovnik in the afternoon. After an organized panoramic drive and photo stop of breathtaking scenery at a hill above Dubrovnik, arrive to the historical center of the city, the famous capital enlisted as UNESCO’s World Heritage site, where your guide shows you the most interesting sights of Dubrovnik. After the city tour you are left on your own to explore the city, visit the City Walls, or take the cable car to the top of Mount Srđ.